Map of the Šariš basin showing the location of Fintice. 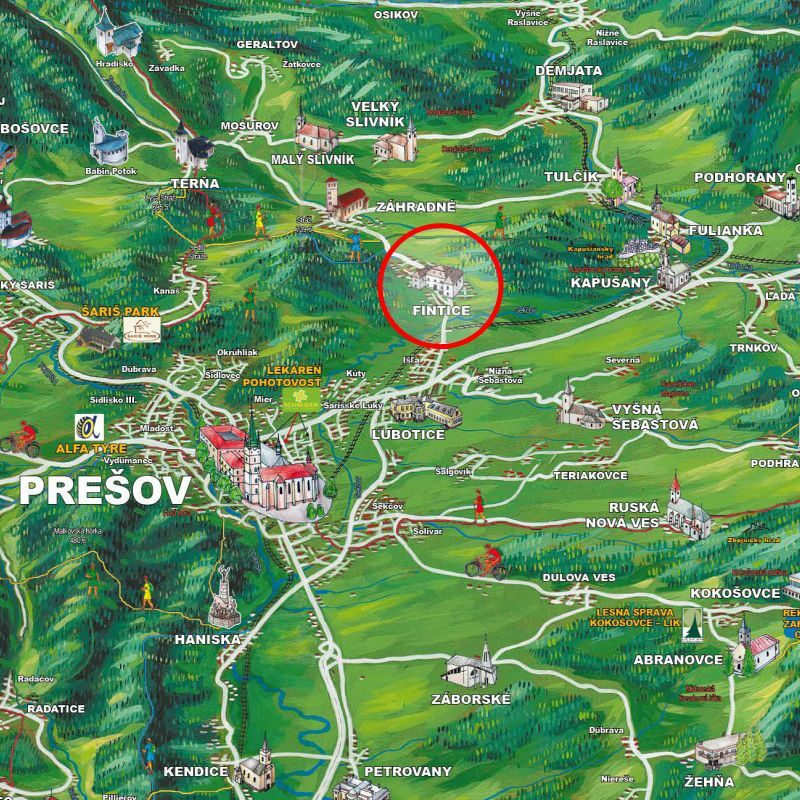 The history of Fintice in what is now Slovakia goes back to around 1272 where it served as a settlement for royal border guards. 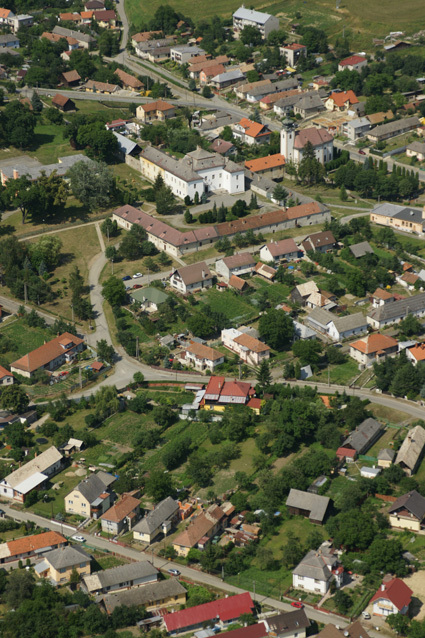 Fintice is situated on the northeastern edge of the Šariš Highlands on the right bank of the Sekčov River, eight kilometers from the center of Prešov. There are vestiges of the original house on the estate. The estate’s real occupation began in the second half of the 16th century when it was owned by the Darholcats. At that time, responding to the spreading of Renaissance ideals, a second tower was added to the building, expanding on it’s size. More information about the history of the church can be found here. 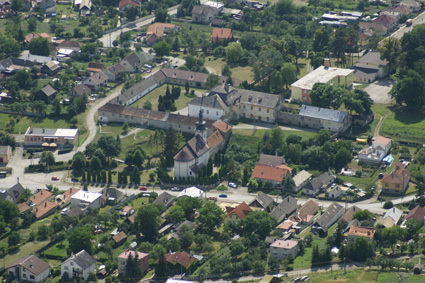 In this aerial image of the estate on the right, you can see the main house in the center surrounded by the stables and outer homes, with a connecting building to the church which is far upper right. The estate dominates and is the center of the town. Here is another view showing the church at the front. The Desseffwy family continued to own the estate until 1923. The four heirs, Marianna, Alajos, Dénes and Béla Dessewffy never married. When the last of those siblings died in 1923, they property was left in charge of Moricz and Adolf Ilkovics who had been managing the property since probably the 1890s. The Ilkovics brothers never lived in the property, but continued to manage it and amass great wealth. Jews were not allowed to own property at that time, but they did profit handsomely from managing this estate. They managed the farm – farming and employees, the brewery in Szedikert, a tavern and liquor store in Fintice for around 4o years total. I visited Fintice in August of 2018. Here is a video of Gabriel Trusa, Estate Fintice Museum Manager, talking about the early days of the estate and the Ilkovics brothers. In this next video, Gabriel shares information from the museum about Fintice musician Jozef Kolarcik Finticky as well as other items found on the premises and provided to the museum from local families. He also shares information about the Ilkovics brothers and their impact on the estate. The granary has been converted into an event hall where it is booked for weddings and local events. In this third video, Gabriel tours us through the Baroque building that is in the process of being restored. The building originally had beautiful frescoes depicting the history of the area, the crests of the Noble families and other scenes from local life which sadly were painted over after the final family to live there, the Sennyeys, left. We are excited to see what the restorations will reveal.